One of the worst things about being a keen cyclist in this city is that it’s almost impossible to ride on the road unless you have a death wish, what with potholes and inconsiderate drivers. We have found the following relatively safe routes. Most of these can double up as very nice walking routes, too. You can start at any point on this circular tour of the city’s parks. 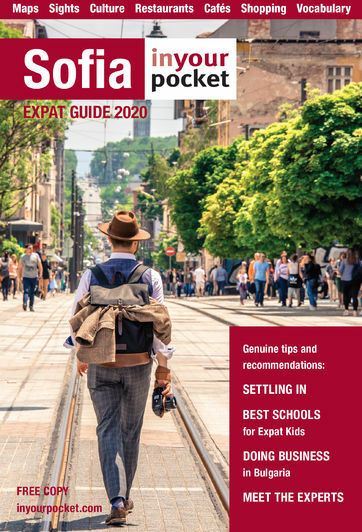 Enter the Borissova Gradina Park at Eagles’ Bridge and cycle through the leafy park, uphill past the swimming pool and through the tunnel under Aleya Yavorov into the Iztok district. Turn right before the tennis courts and cross the tram lines on Dragan Tsankov Blvd. into Loven Park. This is a much quieter park with dense foliage (watch out for mosquitos), where you can see Dunovists (a Bulgarian spiritual movement formed by Peter Dunov) practicing their pan-eurythmic dance. 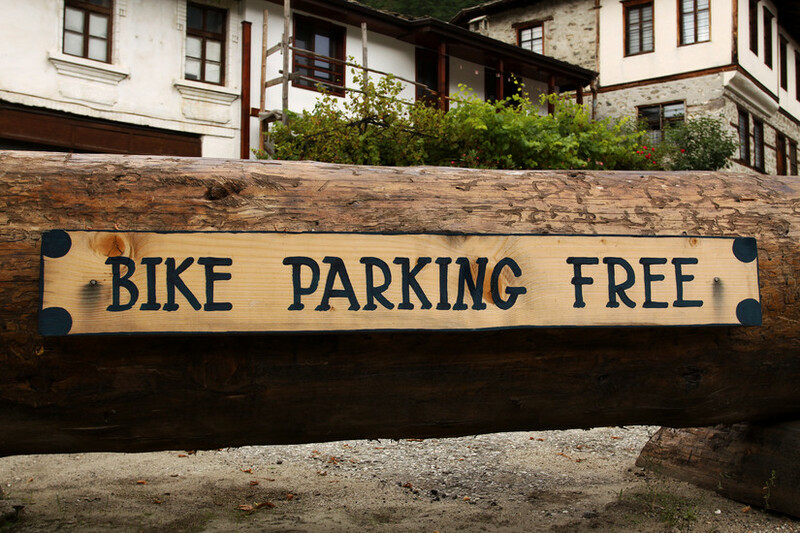 There are various mountain bike practice areas in this park, good for kids and adults alike. Keep going straight ahead, veering slightly left and you will come to the busy Simeonovsko Shosse Blvd., which you have to cross. You will now go into the wood where you will find a wide (but a little scary if you are alone) cycle path that runs along the north side of the Sofia Zoo through to Hladilnika bus station. From here you cross into Yuzhen Park, where you can take a multitude of routes to get to the exit on Arsenalski Blvd. and cross into the smaller part of the park that leads to the Hilton. This is part of the park is clean with nice wide paths and there are some grassy hills for speeding down. To get back to starting point cycle over the bridge, past NDK, down Angel Kunchev St. and through the National Theatre park. An alternative is to use the cycle path along Evlogi Georgiev Blvd., but then you will have to breathe in the petrol fumes. 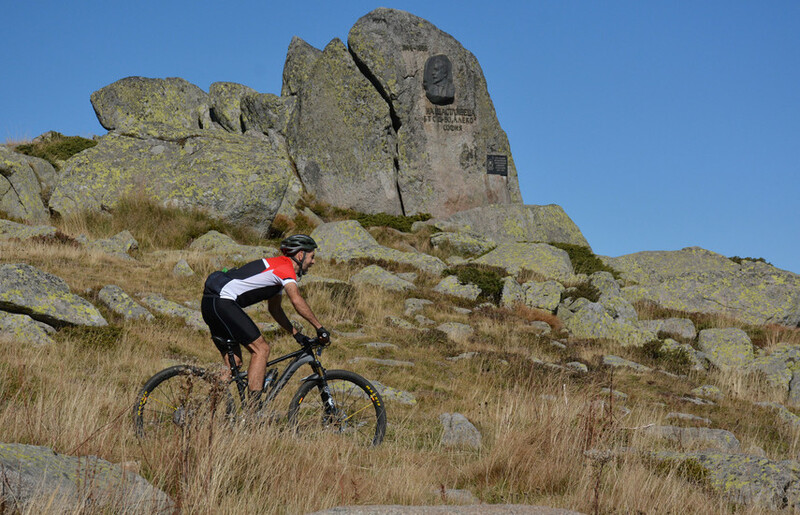 All three routes involve you driving up to some point on Vitosha Mountain, then cycling or walking up to the breathtaking plateau and returning to starting point. Zlatni Mostove is reached from Boyana, as is Kopitoto, Aleko is reached via Dragalevtsi and is the main ski area. The path from both Zlatni Mostove and Kopitoto is about 7 km to the plateau and may be too far for some to walk. It is a tough uphill cycle ride with a lot of mud and stones. From Aleko it is a short walk. At the top of the mountain you see before you a rolling moorland, with individual outcrops of stone and the odd pine tree that can survive the high winds. In the distance is Cherni Vrah peak, with it white golf ball observatory. There are people of all ages, in bathing costumes picnicking, gathering herbs, or even sunbathing in bathing costumes. There are paths to cycle or walk along and they are not particularly challenging, when dry at least. There is no water or food up on the plateau, so take drinks and a snack. At Zlatnite Mostove eat at Momina Sulza restaurant, which has a large field and playground in front and the widest choice of food available: salads, soups, kebapcheta, fries, kachamak. Not gourmet cuisine, but nourishment for starving cyclists. At Kopitoto you can try the expensive 5-star restaurant. There are several huts and restaurants up at Aleko, including the Moreni hotel. This is the only flat route on Vitosha Mountain, following the Rila water pipes from Zheleznitsa and going right round the mountain. 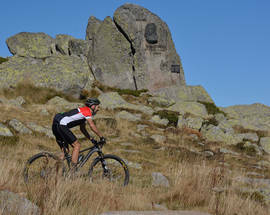 Starting from Zheleznitsa (the entrance to the path is on the right, on a bend, and is marked by a map of the mountain), you will have to push your bike about 500km over rocks to get to the beginning of the Panoramen Put. 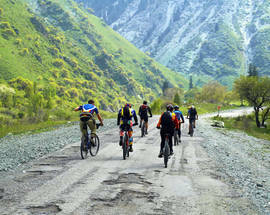 You will be immediately delighted by the smooth, flat path that remains so almost the whole way to Bistritsa. It is mostly in the shade of the woods, occasionally coming out into a clearing of wild flowers and herbs with an amazing view down to Sofia. The path is heavily populated, and you must say ‘Dobur Den’ to everyone you pass. This is Bulgarian hill-walking etiquette. 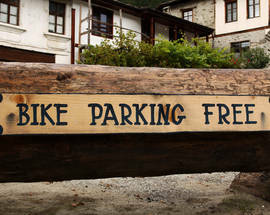 There are tables, stools and carved wooden signs all along the way with words of wisdom. At some point, after about 8km, you come to a crossroads, which points up to Aleko or down to Bistritsa. From here it gets difficult, and more so after Simeonovo. The path gets narrower, hillier and there are more rocks. You go past the so-called Simeonovo Lakes and the Dragalevtsi Monastery, which is about 15km from Zheleznitsa. Apparently the path all the way around the mountain covers a distance of 100km, and once a year in August there is a competition, which includes biking or walking the whole distance. You can start from Zheleznitsa village or from the Belite Brezi restaurant slightly beyond it. Here take the road that points to Plana, off to the right, which is fairly quiet and not too challenging – hardly any cars come down here. About 8km of tarmac road lead you to a picnic area by the river, where you could stop for a rest and then turn back. Another option is to carry on that road through a couple of villages and to reach the observatory, an enormous radio telescope at the bottom of a hill in what is basically the middle of nowhere. From here you enter the Plana Mountain range, which would be better described as one long hill covered in farmland, with a flat top perfect for cycling along. 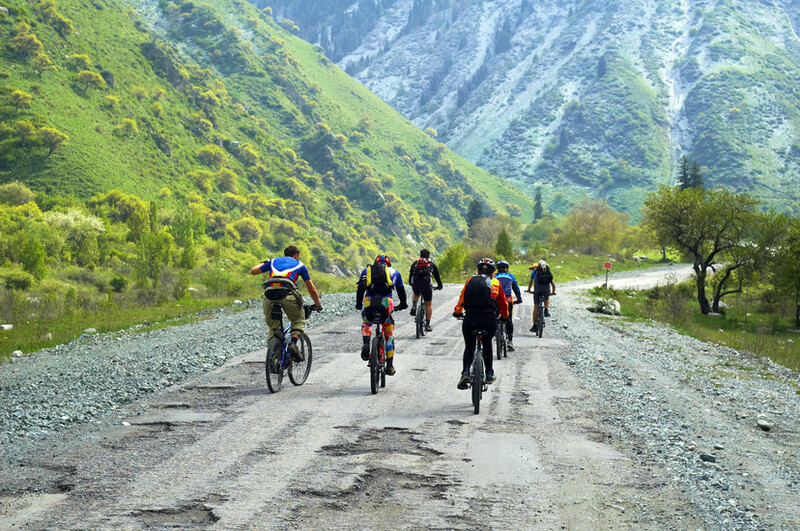 The best place to cycle in Bankya is to start from the Mihailovo district above the town and along a completely quiet road leading to the lovely Divotinski Monastery about 10km away. After a few kilometres you turn off the road into a dirt track, perfectly manageable on a mountain bike, that runs through pleasant woods. There is no food at the monastery, though there is a tap to fill up on water.